The software vendors that have dominated the business intelligence market for the last 15 years or so have hit the wall and they haven’t a clue how to scale it. They’re stuck because they insist on applying the skills and methods that helped them successfully build data warehouses and production reporting systems to a radically different problem: data sense-making. Their past achievements were grand feats of engineering, solved almost entirely with technology, but data sense-making (also known as, analytics) requires a different approach—one that leads with design, not engineering, and focuses on people, their needs and abilities, not technology. Attempts of big BI companies to open the data repository for exploration have produced some embarrassing tools, and they keep on coming. One of the newest examples is SAP BusinessObjects Explorer. When most users think of business intelligence (BI), they think of it in a very traditional sense: predefined reports that can’t account for real-time market fluctuations and that don’t allow business users to truly engage with the information. 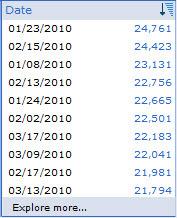 SAP BusinessObjects Explorer software changes all that. 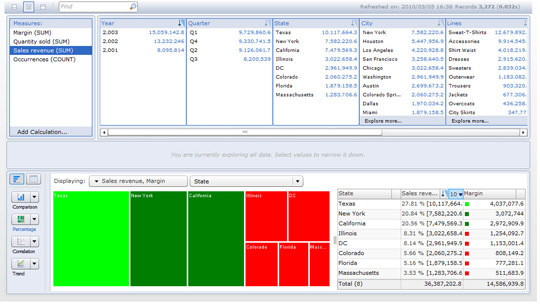 Using the tool, companies can extend the reach of BI to all business users — not just a small subset of expert data analysts…SAP BusinessObjects Explorer enables deep exploration of vast amounts of data, enabling users to identify, manipulate, and act on insights that a pre-structured, traditional BI tool would be hard pressed to deliver. SAP BusinessObjects Explorer is about data exploration, not report generation. The second big differentiator is accessibility. Everybody who needs access to your company’s business data can use SAP BusinessObjects Explorer. While many of your readers work for companies that are now running BI solutions, most of the employees who need access to business data can’t use the tools. Mastering their requirements and interfaces just isn’t practical, so the BI tools remain the exclusive purview of a relatively scarce number of power users, analysts, and IT department members, and the broader business user community has to go through one of these intermediaries to get their questions answered. It’s analogous to the way people made phone calls a few generations back. To place a call, you would pick up the receiver and wait for an operator to get on the line and ask to whom you’d like to speak. If that person was in a different part of the country, a series of local operators, each covering specific regions of the country, worked to facilitate the connection. There was nothing self-service about it. In a very real sense, this is the way BI — and frankly, decision making — works today. SAP BusinessObjects Explorer changes this. It is so easy to use, it democratizes access to data. This is roughly the same explanation that big BI companies have been giving for the last 15 years. Terms like “self-service BI” and the “democratization of data” have been used in association with every new product that they’ve introduced since the day that the term “business intelligence” was coined. Obviously, however, none of their past products have achieved this, which is why they keep coming out with new ones to cure the ills caused by every unnecessarily complicated under-performing product that they’ve delivered in the past. But if the previous generation of products didn’t achieve these goals, why should we believe that BusinessObjects Explorer will? Let’s look at an example of how Becher thinks this new tool will operate in the workplace. It’s pretty common for participants to show up at planning meetings with their go-to PowerPoint presentation, replete with their favorite metrics about what strategic concerns the business faces. And it’s extraordinarily common for these metrics not to match up — at all. Consider a simple question: How many new customers did we acquire last quarter? The Large Enterprise Sales organization recognizes “new customers” as only those with orders in excess of US$10,000. Given that the purpose of the meeting is to devise or refine plans, do you really want to lose another planning cycle sending participants off in pursuit of a new definition of the term “new customer,” asking them to regenerate their figures? With SAP BusinessObjects Explorer, this could be done in real time, with all stakeholders looking at the same data. So, what this new product will finally put within our reach is the earth-shattering ability to get an answer to the question “How many new customers did we acquire last quarter?” without having to involve the IT department. Be still my heart; it’s all a-flutter. A few paragraphs later in the same article, still referring to this data sense-making miracle, Becher states: “If SAP BusinessObjects Explorer sounds revolutionary, it’s because it is revolutionary.” [Long dumbfounded silence] Huh?!!! Lest we be accused of missing the real miracle here, let’s take into account Becher’s claim that this new tool will eliminate the confusion and roadblocks to consensus caused by the fact that the Operations, Marketing, and Sales departments each define new customers differently, and therefore come up with different new customer counts. This must be some magical tool if it somehow puts everyone on the same page, despite their different perspectives. If this sounds to you like marketing smoke and mirrors, you’re getting the picture. 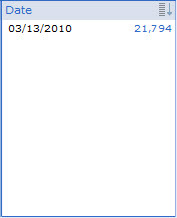 With BusinessObjects Explorer, according to Becher, problems like these will go away. How? Through a new interface that will allow you to ask questions of your data similar to the way you search the Web with Google today. Anyone who understands BI, however, knows that no interface, no matter how magical, will give you access to data that isn’t available, will clean data that is dirty, or will simplify the navigation of complicated operational databases. These improvements are accomplished by a whole lot of hard work on the back end (probably done by someone in IT, because only they have access) to prepare the data for use. Enough of these same old hollow claims by the big BI vendors that have been frustrating and angering users for years. Are we going to let them continue to raise our hopes and dash them forever, never going elsewhere for answers? Let’s forget what SAP BusinessObjects is saying about Explorer and take an honest, objective look at it ourselves. Don’t mistake what I’ve written as a case against Big BI in favor of Small BI. It is entirely possible for large BI vendors to provide effective tools for data sense-making. To do this, they need to switch from a technology-centric engineering-focused approach to a human-centric design-focus approach, and base their efforts on a deep understanding of data sense-making. Most of the small BI vendors have done no better in cracking this nut than the big guys. They might be more agile due to their small size and thus able to bring a new product to market more quickly, but when they approach the problem in the same dysfunctional way as the big guys, they fail just as miserably. Just like politicians who sell themselves as “not like the guys in Washington,” new players in the BI space often point to the failures of the big guys and then go on to do exactly the same. I am not making a case of small vs. big, but of clear-headed, informed, and effective vs. an old paradigm that doesn’t work for the challenges of data sense-making. As quoted above, Jeff Veis claims that “SAP BusinessObjects Explorer enables deep exploration of vast amounts of data, enabling users to identify, manipulate, and act on insights that a pre-structured, traditional BI tool would be hard pressed to deliver.” To test these claims, I asked Bryan Pierce who works with me here at Perceptual Edge to access an evaluation copy of the tool on SAP’s website and put it through its paces. The following are Bryan’s findings. 1) Perhaps the single biggest problem with SAP BusinessObjects Explorer is that it only allows you to view one graph at a time. In addition to this, it only allows a maximum of three measures in a graph, so you can only have three lines in a line graph and three segments in a stacked bar graph. There is a notable—but not useful—exception to the single graph rule. If you select two or three measures and choose a pie chart or a radar chart it will create two or three graphs next to each other, although I couldn’t find a way to make them share a quantitative scale (this would only be applicable for radar charts). Unfortunately, I couldn’t find any way to get multiple versions of any useful graph types. 2) Although you can view up to three measures at once, there’s even less functionality when viewing categorical variables. For instance, the dataset I analyzed had three years’ worth of quarterly data. Using a line graph, I could view the values for the three years and I could look at a particular year and see the quarterly values, but I couldn’t find a way to view all three years at a quarterly level simultaneously (either by using a single line that spanned twelve quarters or by using three lines that each spanned four quarters). Similarly, while I could get two lines or stacked-bar segments for Profit and Expenses (both measures), I couldn’t find a way to get separate lines or stacked-bar segments for States or Cities. 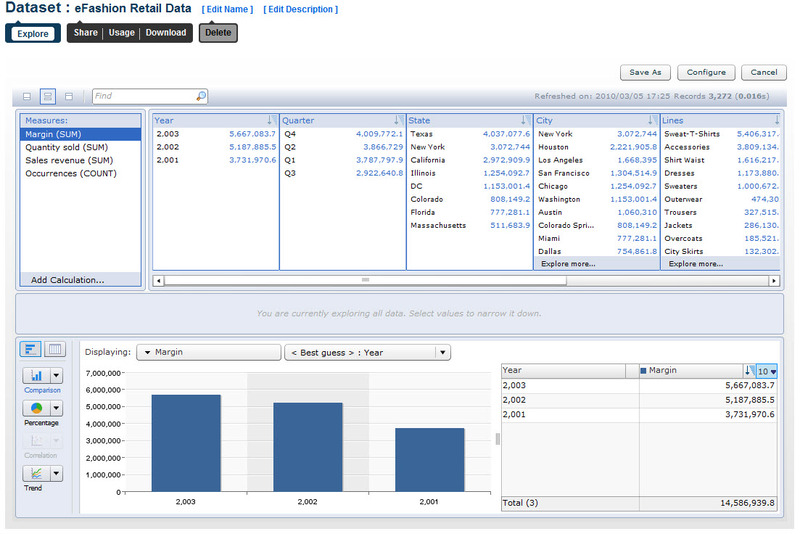 4) With BusinessObjects Explorer, you’re not able to customize the appearance of graphs in any way. This isn’t as important as it would be for a data presentation tool, like Excel, but even an analysis tool should let you do things like disable the gridlines or remove the data points from a line graph. 5) Like most web-based analysis tools, it responds too slowly for seamless interaction. After a filter is applied there is short delay while the application contacts the server for the new data. This delay is only about one or two seconds long, but that’s still more than enough to hamper an analyst’s train of thought. 6) There were several times when I switched over to time-based views where the graphs weren’t sorted in chronological order. For example, I was viewing a bar graph that showed Margin and Quantity Sold by State, which was sorted by the Margin values. I then switched from viewing the graph by State to viewing it by Quarter. The sort by Margin was still in effect so the graph displayed the bars in this order: Q4, Q2, Q1, Q3. It’s one thing to allow people to arrange time-series information in non-chronological order for those extremely rare cases when that might be useful. It’s quite another thing to allow time-series data to be arranged in this way by the software. 7) The program includes all the standard graph types and a few unexpected ones, such as treemaps (although, how useful is a treemap when it only takes up about 1/3 of your screen space? ), but it doesn’t include box plots. In a functional treemap, I should be able to display each city’s data as a smaller square within the corresponding state square and, potentially, to select a particular city and drill into it to see even more detailed data (such as sales by individual stores). Unfortunately, I could find no way to do any of this. As a side note, red and green are the worst two colors to use to encode data (in this case they’re encoding margin values from highest to lowest), because most people who are colorblind (10% of males and 1% of females) can’t distinguish between the two colors. I would have switched to more suitable colors, but, as I mentioned before, I couldn’t find a way to modify the appearance of any of the graphs. If the filters had been designed to size themselves based on their contents, more filters could have fit on the screen at the same time, which would make filtering more efficient. 10) The shape of the graph is also a problem sometimes. Because the plot area is about four times wider than it is tall, it makes certain types of graphs awkward to read, such as scatterplots (which should usually be roughly square in shape) or vertical bar graphs that only have a few bars (in which case, the bars might be wider than they are tall). As you can see, the totals aren’t all written to the same precision. The Q1, Q3, and Q4 totals are written to the tenth of a dollar, while the Q2 total is written to the whole dollar. This means the decimal points don’t line up, which makes the numbers harder to read. These are the problems that Bryan found while spending two hours with the product. A deeper look would no doubt produce a longer list, but Bryan was only trying to spot the big problems that most severely undermine the products use for data exploration and analysis. Had we taken the time to compare BusinessObjects Explorer to one of the good data exploration and analysis products that are available today, such as Tableau or Spotfire, the claim by BusinessObjects that Explorer is “revolutionary” would be exposed more clearly for what it is: a sad statement about this Big BI company’s understanding of data sense-making. BusinessObjects is struggling to catch up with human-centered, design-focused companies like Tableau and Spotfire, which are running circles around them, and making them look pathetic. SAP BusinessObjects and most other Big BI companies haven’t taken the time to understand data sense-making in general, data visualization in particular, or even the real needs of their customers. They need a new mindset, but learning to see the world with new eyes is hard. By the time they figure this out and make the shift, will it be too late? Steve, great article and having looked at Explorer myself I was suitably unimpressed. I have used BusinessObjects for the best part 10 years and am now a full time consultant. I recognise all those grand statements from previous product releases. Unfortunately clever marketing and flash demos to the easily pleased decision makers will probably sell enough units for SAP to ignore recommendations from true experts. One area I have always found to be a problem with all “self-serve” BI tools is that some people are unable to apply the necessary logic to a dataset to find their answers. They know what they want, but are unable to filter out what they dont want. The Logic of “Where” clauses and “AND/OR” eludes them however the product hand holds them through. The fact is they never will get it and frankly dont want to. A well built Dashboard or suite of reports built by someone who understands the questions, how to get the answer and how to correctly display it is surely a safer bet. Too many people have used self serve tools and thought they were looking at the answer when because of their lack of understanding of data analytics they are not. Bad business decisions then result from wrong answers. The entire premise of the announcement is that analytics is something that can be done in a self-serve manner. But executives and managers aren’t doing their own analysis for a lack of the right tool. They don’t do their own analysis because analytics requires a specific skill set which they simply do not have and because performance analytics takes both time and the experience to know how to combine the data in a meaningful way. Technology can only take us so far and as you’ve clearly pointed out Steve, there are good tools out there. Unless and until the managers and executives gain expertise in the fundamentals of analytics, statistical theory (particularly variance and sample size issues), Boolean logic, and, perhaps most importantly, the ability to ask the right questions of data and an understanding of the limitations of its ability to provide an answer, the specific tool being used will be beside the point. why should all data visualization solution called explorer? I know at least 5 of them! Very interesting article. My institution’s infrastructure team seems finally to have allowed us business users explore and find their own tools and then implement the ones we want. As a result, we’re rolling out Tableau Server instead of Oracle BI tools and I for one am extremely happy! I was given the opportunity in October 2008 to participate on a team that was evaluating Business Objects. I wrote a detailed review of my findings, how the tool maps to our requirements, the positives, the negatives, etc. Unfortunately in the end, the superior skills of SAP’s sales force won out. A decade plus has passed and traditional BI remains in a quagmire of programmatic approaches to what business managers need. Time to implementation measured in weeks, business executives waiting on an analyst to get done change passes them by. New names same story. – IT buyers are far more sophisticated today than most vendors assume. They know far more about the market than the people on the vendor side who craft marketing messages. And they’re very cynical toward the grandiose claims made by vendors. As vendors, we can start by being absolutely honest and respectful of our customers. Honest about what we do well and what we don’t do well, and respectful of our customers’ knowledge and expertise. I think it’s important to separate the marketing of these products with the products and the realities of the business environment. Don’t get me wrong, I’m not defending SAP. I’m just saying that… well, that talk is cheap. That said, the product review seems pretty weak especially for a big player in the space. I think the big players just can’t deal with bringing out innovation in the midst of the politics, sacred cows, and bureaucratic mess of their built-on-acquisition businesses. The sad reality is that all the big vendors are focused on feature checklists as opposed to what I like to call “feature excellence”, because that’s what closes deals. It isn’t until after the check has been cut that buyers realize the tool doesn’t really perform as expected. I like that there are a lot of smaller players (i.e., the Tableaus of the world) who are focusing on feature excellence to carve out their own niches. My only worry is that these smaller vendors will soon get gobbled up by the big players, and have their products in effect die as part of a larger piece of bloatware. Steven Ng nails it. And that’s exactly what’s happened so far – big players (like Business Objects) gobbled up innovative smaller players, grafted their solutions onto their existing product suites (poorly) in an attempt to fill vapid checkboxes, and then left the acquired products to die virtually unused. All the while ignoring their core reporting tools, which could have benefited from having many of these innovations integrated into a framework already being used by hundreds of thousands of analysts and developers. But no – that would require actual product development, which takes money away from executive bonuses. Sooner or later someone – probably a cloud computing outfit – is going to enter the BI space and wipe out the likes of Cognos and Business Objects the way the asteroid wiped out the dinosaurs. Good riddance! It also seems to me that too many users of BI, and all the BI vendors, have a tendency to start with the data they have and then analyze it, hoping that this process will somehow improve decision making. Instead I believe they need to be clear and explicit about the decisions they wish to improve and drive backwards from those decisions to the analytic insights and ultimately the data that will help them do so. Without this focus on decisions, without beginning with the decision in mind, I don’t think any BI tool is going to help. Great insight, but I shall admit that James point is right: most BI projects are IT initiatives “hoping that…”. This is of course far from ideal but in practice finding analytic users is more the exception than the rule. I read the more elaborate thoughts that you posted about this in your blog (see the link in Franco’s comments above). I think your response is spot on and insightful. Thanks for weighing in on this so thoughtfully. That was a thorough analysis in just 2 hours of review, and an honest one too. I’ve had Explorer presented to me many times and I was always left wondering “is there something I am not getting”, because I didn’t see what all the hoopla was about. You might not be surprised to learn that you could count Explorer customers on one hand, and there is a reason for it- I can’t figure out what kind of person would use a tool like this, given the alternatives available (even in SAP’s portfolio). As a former BO consultant and now software channel guy here’s my hopefully two-cents worth. When a platform vendor like SAP gobbles a BI vendor that vendor is put into the service of the platform vendor’s main thing: i.e. ERP, and in the case of SAP, black-box ERP. That means that SAP is milking BO’s old customer base for referrals WHILE it shifts BO’s product line toward black-box ERP. One big factor must be deflecting of attention from (useful) functions like analytics which tend to interrupt the full adoption of R/3 and the rest of SAP’s real businesses. After a recent channel partner search and discussions with several BO platinum partners it was obvious that they would dump SAP in a minute if they could recalibrate their business model and survive. BO was once a solid and serviceable reporting tool that has become a monster. The same could happen to Tableau and the other innovators if they fall into a platform vendor’s hands OR fail to stay focused and develop deeper channel partnerships now after the big Gartner move. Technology is only as good as the company behind it and being nimb le, glib and cool is not the same as wise and effective long term. While I can’t speak to the specific technical issues you describe in Business Objects Explorer (I’m a Cognos specialist), I do sense an overall frustration with BI generally. I think it is important to break the issues you raise into 2 specific parts – the one on BI self-service and the one on the technical deficiencies of a specific BI product. Although they may be related, they are quite distinct in my mind. BI self-service will be a total failure in any organization without explicit communication across the enterprise about who is reporting on what, why, and how it all fits together. These are significant challenges, and it may change the way your business users have worked up to now. Technical challenges may be specific vendor-to-vendor, but I expect that overall each product will get you to the same destination eventually, albeit by a different path. What is important to note, however, is that each product within a BI suite has its own particular strengths and weaknesses. For an example from the Cognos side, if you want to do large scale data extracts you use Data Manager, not Report Studio (I have seen users try and fail to do otherwise). If SAP Business Objects Explorer is anything like Cognos Query Studio, it is a streamlined reporting environment with limited functionality – in Cognos, complex reports need to graduate to Report Studio. In other words, make sure the tool matches your reporting needs – don’t use a hammer if you need a screwdriver, and don’t use a screwdriver if you need a power-screwdriver. I know that sometimes marketing folks oversell the product and offer you the earth, moon and stars, but I have also seen a lot of success with the BI products I know (including Cognos, Microsoft, Oracle and Crystal Reports). I encourage you to raise your specific issues with your IT vendor and/or IT consultants to come to a resolution to your technical issues. While the BI vendors that you’ve listed do some things well, none of them support data analysis, and data visualization in particular, effectively. They don’t seem to get it. Every one of these vendors have people that work for them who do get it, but so far these guys have little or no influence over the development of the products. The skills that have made these vendors successful in the past are not the skills that are needed to build effective data sense-making products. I wonder if they’ll figure this out in time or if they’ll be displaced by smarter, more agile vendors. Very interesting thread, and lots of good commentary. Even as a BOBJ partner and reseller, I must agree that I’m not overly impressed with the functionality of Explorer. But on the other hand, this is a pretty new product for BOBJ, so hopefully it will improve over time. I guess I’d say (agreeing with some other comments) that the marketing department really over-hyped this product – it’s not for real analysis; it’s for getting simple numbers quickly. But BOBJ marketing should ensure they don’t represent quick access to a few values to great explaratory analysis. Thanks for this post. As usual you strike directly at the core of the issue weather it is the misconstruction of a chart or a poorly designed and widely used business intelligence tool. The reason why I am posting here again is to challenge you once ore on your continued view that the answer is not in technology. Although I may agree that leading with design is a better approach (if not a requirement), it is based on a few assumptions: (i) that you have all the data accessible and usable, (ii) know what information or metric you are trying to visualize, and (iii) that is simple to manipulate that same data in order that charts as clear as the ones you create and use in your books can be produced. Can you perform all those 3 tasks without technology or will a data analyst focus a disproportioned amount of time on bringing data elements to the surface, linking/joining them together, and manipulating it in order that it can finally be visualized instead of optimizing the visualization and concentrate on the information that the chart is conveying? To me it is clear that new technology is needed (not outdated OLAP dashboard builders such as Business Objects, Cognos, QlikView and many others). We should be able to have an underlying tool in which the data analyst can discover cause and effect relationships, find new useful facts out of massive disconnected data silos as well as forecast, predict, collaborate, and publish. This is not what these cube browsing tools do and in that respect your post raised my belief again that my quest is not a one man’s dream but rather a necessity for anyone in the business and scientific communities. While reading your books and blog entries, I frequently ask myself how do you compile the data for the charts? Is the data that you use already perfectly aligned to produce the charts just right? How much time do you spend in Excel or other tools massaging your data before it is useful to be used in one of your many examples? And how does that cycle of data preparation leading to data visualization interfere with the key task at end which is to provide clearer reporting and focus the reader on the information being presented? This would be very interesting to me to find out. You misunderstand my position. I do not believe that we can make good use of data without technology. Everything that I write about and teach assumes and advocates the use of technology. My position is not that technology doesn’t play a role, but that its role is to support us by augmenting our data sense-making abilities, not by replacing them, and that only technology that is well-designed will serve this purpose. Our users are generally looking for access to data, trending and basic comparisons and, generally speaking, don’t have the ability to specify what they want before we complete a project. “Give me everything” is the most common response. Given the alternatives, Explorer seems like a reasonably efficient solution for enabling basic exploration of newly developed corporate data assets before my team commits to taking that shot in the dark to develop 200 reports, most of which won’t be used. In addition, the boundaries around the information space do provide a certain amount of “goof proof” compared to the more open ended ad-hoc capabilities offered in the Business Objects suite. Unfortunately, Business Objects Explorer won’t provide what you need. You need a tool that will allow people to explore data in a flexible, enriched, and efficient manner, as easily as possible. Attempting to do this with Explorer would be like using a rake to play golf. Unfortunately, Business Objects does not have a decent tool for data exploration and analysis. To find the tool that you require, you’ll need to look elsewhere for now.